I love this technique with the minis, and am sure to use it — how easy that is to do with the mini’s! Thanks so much for the giveaway! LOVE!!!! what a perfect way to use the minis!!! gorgeous, girlfriend!! I love these little inks! Thanks for the chance! The card is simple but elegant. The use of perfect pearls is a great finish. Thanks for sharing. 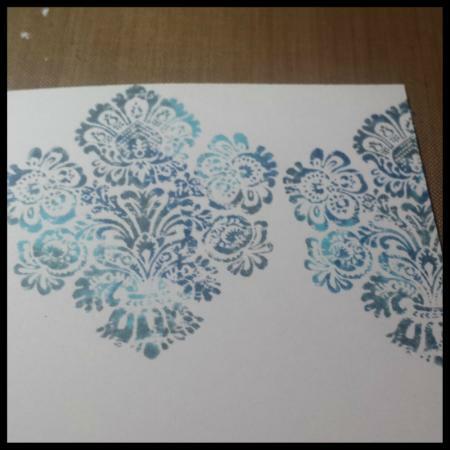 Love your card…agree Damask stamp is beautiful…great color choice!!! Great job!! Oh my! That background is fantastic!!!! I love the technique here. I have never tried this, odd huh? thanks so much! Joy the card you created is beautiful. The background is gorgeous for that powerful sentiment. The Distress Damask stamps are so perfect for creating vintage background! Love the use of Perfect Pearls also! Enjoy the week. Hugs! Mmmmm – love those perfect pearls. I haven’t tried them with distress inks. I’ll have to do that in the future. Lovely card, and an easy tutorial. Thanks! What a pretty card! I love how the simplest things can have so much impact. Love your tutorial. Would love to try these babies for myself. Thanks for the inspiration and a chance to win some minis! Beautiful card! Love those minis and their new applicator. Can’t wait to play!! Joe, I loved how you made your own background with the three colors and made the sentiment to match. I think I really need to get that mini blending tool as well as the mini distress inks which I love and use all the time. This smaller size is great for traveling too. Thanks for the giveaway! ohhhh!! LOVING these Miss Joy! FUN & SUPER CUTE card!! Joy-o, love your card & of course the fabulous mini’s! Lovin’ the perfect pearl, I think I need some of that also, love me some shimmer! Love the card. Thanks for the chance to win a set of the new mini stamp pads. Beautiful background paper! That’s one of the great things about the minis, the ability to ink up such a small space with each one. thanks for the tutorial…these minis sure look like fun…didn’t think I’d need them…but I guess I really do! Love this card. Would never have thought to use Perfect Pearls on these inks, now I can’t wait to try it out. Live the new sets. Your card is divine! 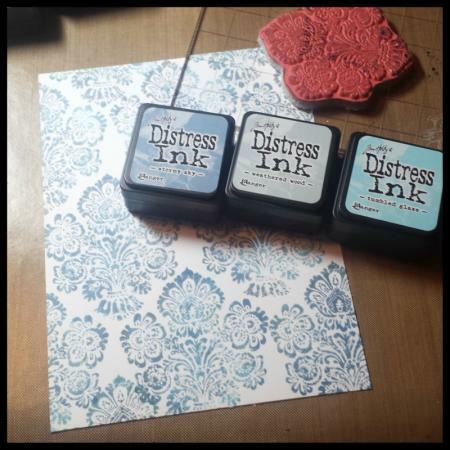 Love the new distress ink pad minis…so hoping I win a set! The 4 colors per set are just super! I wouldn’t call your card simple rather gorgeous, I loved the background and then the text on top of it! I love the card. I’ll definitely have to try the perfect pearls technique. Love the addition of the Perfect Pearls! Gorgeous! I love your card. The minis are perfect for your technique. Lovely card, simple and elegant. Thanks for the chance to win some inks. Love how you used the single stamp to do the background! I love all the tutorials I have been seeing using these minis – I can’t wait to try them! I LOVE these minis!!!! And your card. thanks for the inspiration Joy – lovely card! 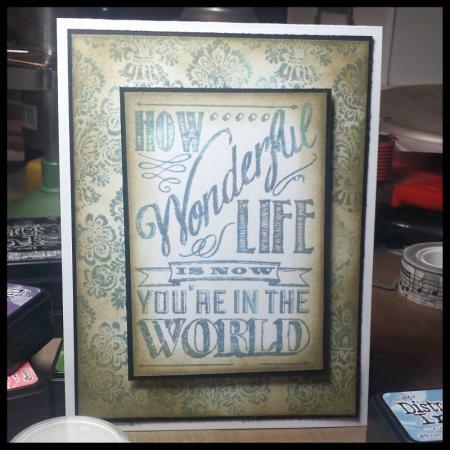 What a beautiful card you made using only a few different products! I love the damask background. It looks like old wallpaper to me! 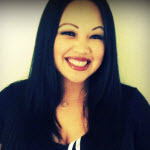 I live the minis … Has been my go to since I got my sets and can’t wait til the new ones get here!! What a great background and I love the way you added the Perfect Pearls for the shine! What a fabulous card! I love that background you created. Terrific creation! I would love to win Tim Inks! Selective inking will be so much easier with these small pads and I love your use of Perfect Pearls. Beautiful card, I’m always learning something new thanks, never thought of putting perfect pearls on!! Wow, love this card. Yeah for different shades of blues!! The picture really does not do the shimmer justice!! Thank you for the opportunity to win these great little mini ink pads!!! Thanks for your tutorial and the cool give away. Hugs, Susanne. Beautiful card! Thanks for sharing! Love how you used the different blues and perfect pearls!! Thanks, also, for the chance to win! Wonderful color combination for your Wonderful Life Card. WOW! Beautiful card and LOVE the Perfect Pearls on there! Awesome card – love the technique. 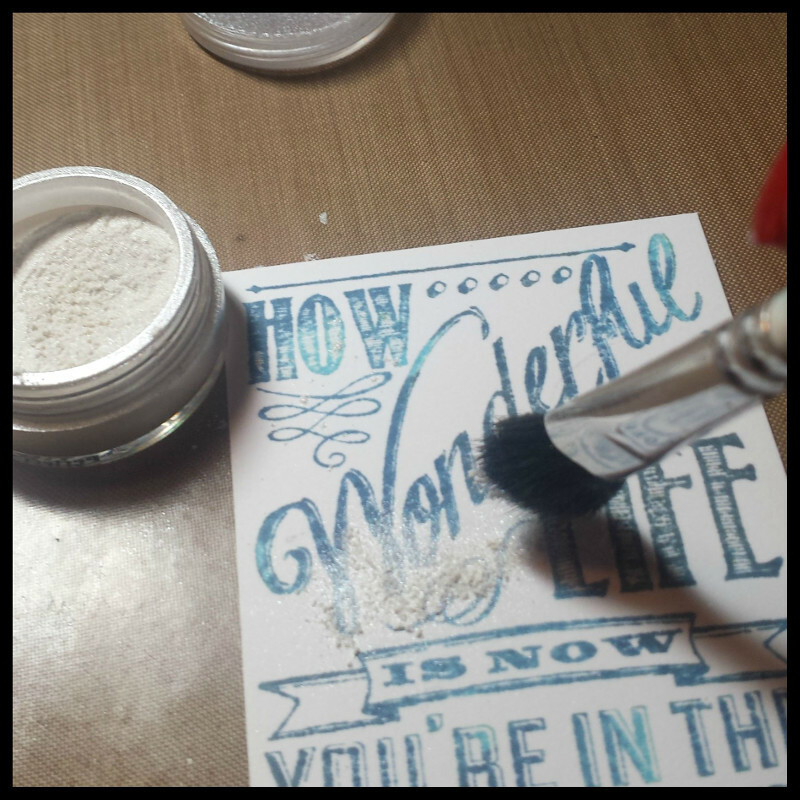 That’s a must try technique, I think I’ve done it with stencils but not with stamps! The card is beautiful… like the shimmer perfect pearls gives too! OOOO. I’m going to have to try this…looks wonderfully shabby! Love your card!! Very vintage! Gorgeous!! Thanks for the reminder to bust out those Perfect Pearls–a great partnership with the Distress Inks!!! Great card! Loving the Mini Distress Ink Pads! Thanks for the opportunity to win. The mini’s are not only adorable but also great for this technique. Inking up parts of the stamp. Love it! Thanks for the chance to win! The card is lovely, thanks for the chance to win the mini distress ink pads. 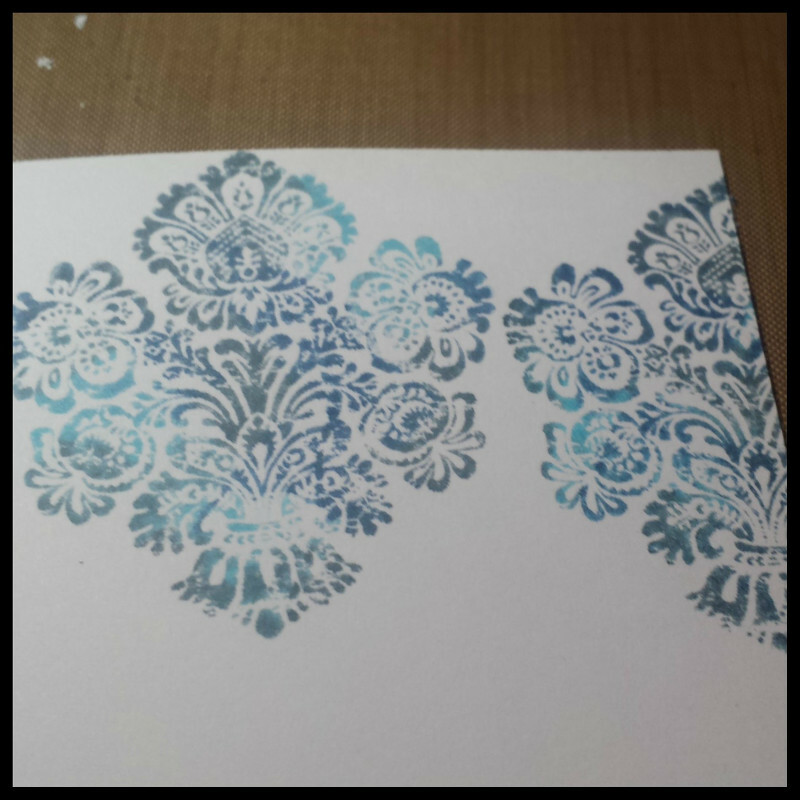 The distress damask made a beautiful background for your card. Love the minis and the new colors are some of my favorites. Thanks for the tutorial on your beautiful card. Gorgeous background for your pretty card! I love the way you mixed the colors! I love that set as well Joy and your card! Thanks for sharing your inspiration and beautiful work. Great card Joy! Aren’t these little pads so much fun! Love you card! Thanks for sharing. This is gorgeous! Love all the blues. Wow…beautiful card, Joy! I love the addition of Perfect Pearls…and the background is fabulous, too! Beautiful Card. Love the technique! Thanks for the inspiration! Love these little minis! Just go ahead and send them to me because I am Tim’s biggest ink fan. LOL I love the way the distress ink works. A beautiful card, and great techniques. I love the perfect pearls on this card. What a beautiful card! I simply love how these minis can accomplish things that the full size pads just can’t (or that are much more difficult with the full size pads!). I’m amazed at all the ideas out there for the minis! Thanks for sharing the perfect pearl technique. The minis are so cute. Lovely card. . . thanks for the tutorial and the chance to win a set of the amazing mini distress inks. What a casual, subtle card! I need to use my Perfect Pearls more often this way. Gorgeous card, gorgeous effect. Thanks for sharing and for the chance to win the DI minis! Nice card! Thanks for the chance to win some minis of my own. Thanks for the tip, your card is great. Love that sentiment. Very beautiful card and the colors you chose! Thanks for the chance to win! Beautiful card! Love these new sets. I will have to try adding the perfect pearls, I have never thought to do that! Thanks for sharing. Beautiful card! Love these new sets. I will have to try adding the perfect pearls, I have never thought to do that! Thanks for sharing! Confused…if won’t let me post…it thinks this is spam? Hmm, it is not letting me post…let me try again! Beautiful card!! I like the sort of shabby/retro-vintage look you have created by pairing the damask and the chalkboard look greeting stamps with the distress inks and perfect pearls. The card is awesome! Thanks for the chance to win. Hi. Love your card and the way u used the mini inks with well coordinated colours…wow…thank you for the opportunity to win the set. Love the way the perfect pearl looked on your card. So in love with the new minis too. Wonderful card….TFS and for a chance to win. OMG! Do I love this card! I have a brand new granddaughter, Luna Joy, and it is such a perfect sentiment…”Life is more beautiful now she’s in the world”! I want to make this as a keepsake for her. Love, love, LOVE the new minis. Is Tim not the best? You’re amazingly talented as well. I love your card! The only trouble is I need all 3 sets to get the 3 blues you used – that’s my excuse for buying them anyway LOL. Love this post. Beautiful results and color! Oh my word! Your project is really stunning! I just LOVE how you use the distress inks, stunning!!!!!!!!!!!!! The technique you used for the background created some gorgeous stamping!!! Live using perfect pearls with distress inks! Thanks! What an awesome card, and so simple with these mini pads. Love to have some!! Oh Joyous, this is beautiful! I love when you stamp!!! Love these itsy bitsy guys. So very handy and portable. Stunning card! And so simple! Thanks!! 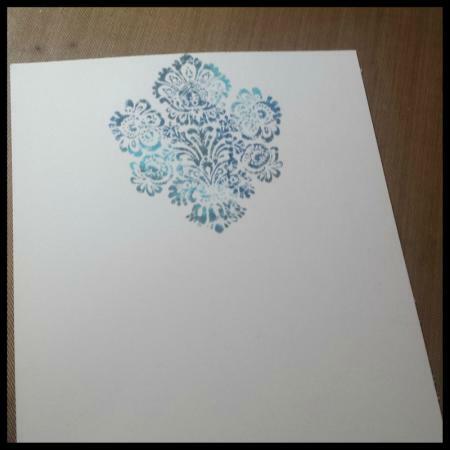 Love your gorgeous card and the way you have used the ink pad minis! I like that you chose colours that are sort of tone in tone, it makes for such a stunning card, love it! thank you for the tutorial and the chance to win these beautiful little inks! Oh,gorgeous card!I love all the sweet colours you chose!Very lovely! Thank you for the chance to win these little guys! Little cubes full of gorgeous goodness!!! Love the color combo and the distressing around the edges and perfect pearls is delightful!! Thank you for the inspiration and chance to win! who said that inspiration doesn’t come in small packages? these colorful quartets are absolutely must-haves. thank you for your inspiration this morning and for the chance to win these minis. i have my fingers totally crossed. Love this technique and thanks for sharing your talents. 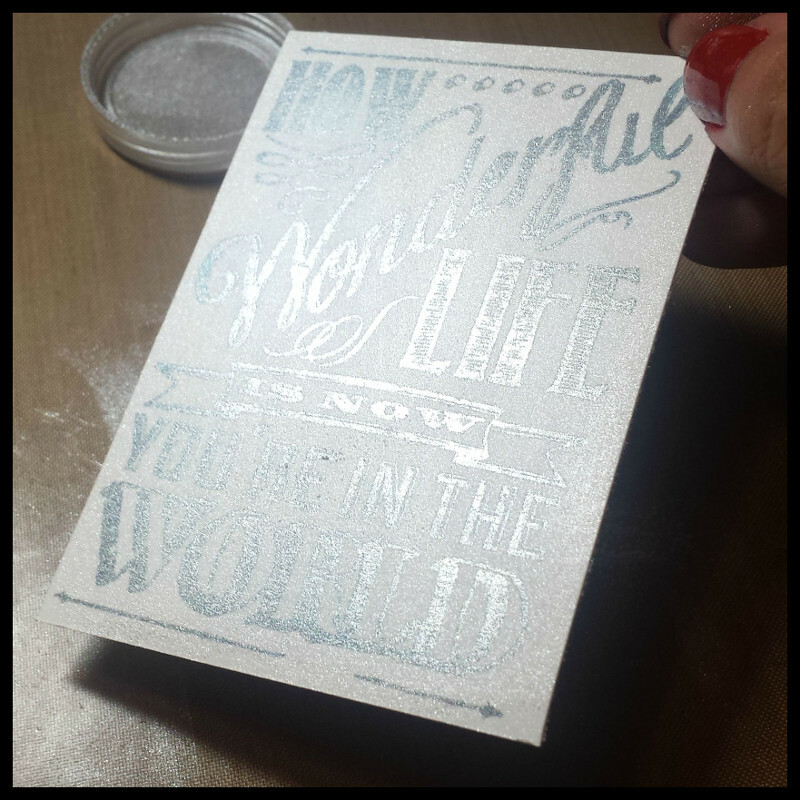 Gorgeous shimmer on the greeting – what a fabulous card! Thanks for the chance to win too. Love this card! You make it look so simple, yet it is so elegant! Very pretty! Thanks for sharing!! Thanks for sharing your inspiration and the opportunity to win some yummy mini’s. Beautiful card. The mini’s look great to work with, can’t wait to get some. Your card is simply gorgeous! Thanks for the giveaway and the inspiration! Love these minis and your card is gorgeous!!! Thanks for the inspiration. I am going to grab a cup of coffee and start reading. Thanks for the chance to get the minis…..
LOVE this technique, never thought to use the perfect pearls this way. Thanks for the inspiration. Love ranger inks and all things Tim Holtz. What creativity. Love Love Love this card! Putting a continuous design with that lil’ stamp is a great idea! thanks for sharing this wonderful card! Beautiful card! The minis are so useful for that technique. Thank you for the chance to win the new sets. Great way to use these wonderful minis! Love this card. Very subtle. Haven’t thought of using PP like this. Thank you for the chance. Love those minis! Thanks for the chance to win some. Tim is a genius how he put these luscious colors together. It’s a no brainer to use them in sets. Love to win the new ones to go with my first ones. I have to have every color. This is a great tutorial! I do love the result, too. Thanks for the opportunity to win the new minis. Love the Perfect Pearls with the Distress, since it stays wet long enough to add the little shimmer! Can’t wait to get some of these minis to be able to control the ink as well as you did! Love your tutorial and project! Thanks! Great technique. I love all all the colors blend so well together. Excellent Technique! Those minis are awesome! Love the way the pearls attach to the ink since they stay wet longer. Great card. Lovin me some Timmy mini!! I love this card!!! Awesomeness it is!! Love the colors of your card. 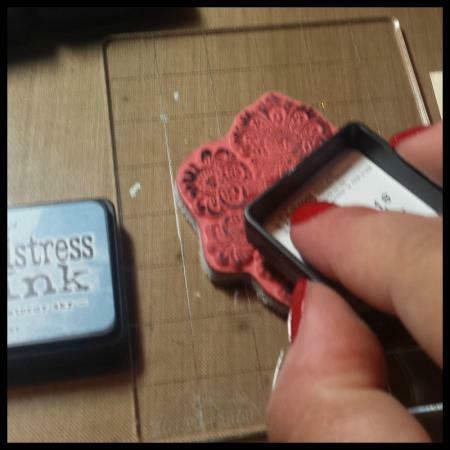 Mini distress pads… love them! Such a pretty background with just the one stamp. 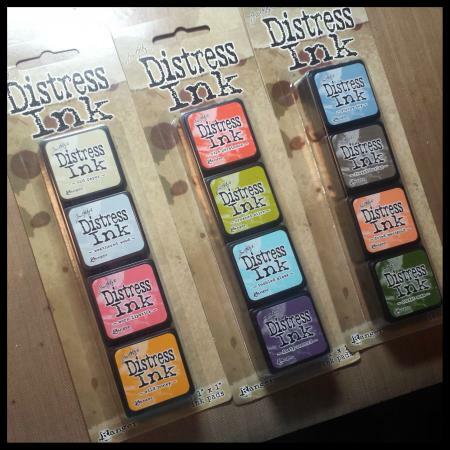 I would so love to win a set of the Mini Distress Ink Pads. That card is gorgeous! Love it! Thanks for the opportunity! BEAUTIFUL card! Love the color combo and the perfect pearls shimmer! I love this card! The minis are just fab to use in a project like this! Wonderful job and thank you for a chance to win! LOVE those minis. So convenient and so versatile. So much usefulness in so little space. I LOVE them. What a clever way to use the minis on stamps! Definitely going to do this. Thank you! I love how the all the minis in the sets work together. Thank you for sharing the details of your card creation – it’s wonderful. Love it!! Thanks for sharing your fabulous ideas. I just starting using Tim Holtz inks and appreciate all the inspiration you provide to all of us. I love the background and how you used the inks! Your card is so lovely. Great job! LOVE your beautiful damask card! Thanks for your tutorial and inspiration. And REALLY love the distress inks by Tim Holtz. I never thought about using the distress inks in this way….I always see them with water techniques. Love the look!!! Wow! This is really beautiful! I love this! Thank you for the inspiration! Love your card! Thanks for the tutorial…and the chance to give the new mini’s a REALLY good home! 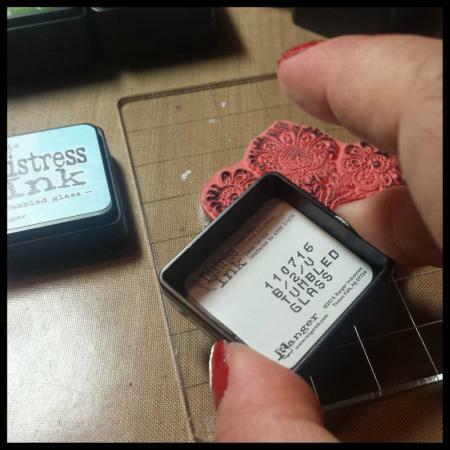 I love the combination of distress inks you used on the stamp. I’m writin’ those down..Adding the perfect pearls was the perfect touch, too. The whole thing was just terrific… Thanks for the chance at the mini’s. What a quick and lovely card. Thanks for sharing. Would love to win the inks. Such an elegant card! It looks easier to do this with the mini inks. Thanks for a chance to win. What a classy card. I loved adding the perfect pearls for an elegant touch. Thanks for the chance to win some minis. What a beautifully elegant card! I’d love to win these mini sets. I love how easy it is to ink things with those tiny distress ink pads! Your card is lovely! Wonderful tutorial! Thanks for the informative pictures and giveaway. I love the background you created! I also love the shimmer on the sentiment. I always forget about my Perfect Pearls. I need to use them more. Great card!!! I love those little guys….. I love how you used the Perfect Pearls on your card! I HAVE to try this. It turned out beautiful! Perfect way to show the versatility of the mini ink pads. Love how your card came out, just beautiful! Such precise stamping, gorgeous piece and thanks for the chance to win! Your stamped background reminds me of an old piece of the wall paper…great colors & inspiration…what’s old is new again. I’m a newbie to distress inks….having so much fun. I loved the background you made for this card. Great job! Thanks you for the tutorial and for the giveaway too! I love that you can add the Perfect Pearls while the Distress Ink if wet!!! Never knew that! Thanks! The card is beautiful…and how clever of you to use 1 ink from EACH set; we definitely need ALL THREE sets to accomplish this look 😀 Thank you for the tutorial and for the opportunity to win some mini inks. Thanks for a chance to win the mini inks!!! I love your card! Great colours! what beautiful stampings with the mixed colors! Inking the stamps with different colors is a perfect technique for the minis! 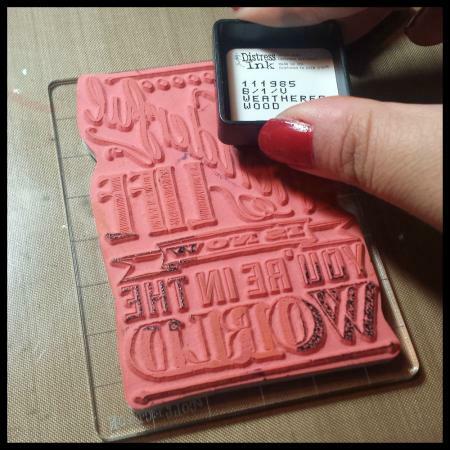 The stamping ideas are wonderful! The minis are so perfect for them! I thank you for the chance to win a set and the great tut you wrote! what a beautiful card – thank you for the chance to win!!! Pretty card! Thanks for the reminder to dust the distress inks with a little perfect pearls, I want to try that. Great technique! I would love to win a set of these mini Distress Inks. 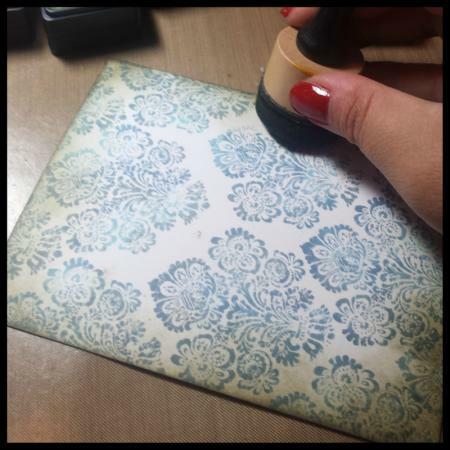 I love the background paper you made with the damask stamp. I never think of taking smaller patterned stamps to create a background and the multiple inks in the same color is beautiful. Love the stamping you did on the card. I would like to win some of those minis so I could give it a try. Great of you, Tim & Ranger to make the give aways possible. Beautiful card. Thanks for the opportunity to win a set of the wonderful new minis! Oh wow – that is a gorgeous card. I love the subtle colour variation of the stampings – they look wonderful. I love the shimmer of the Perfect Pearls over the distress ink – thanks for sharing! This card is aged so perfectly, it left me gaping. Beautifully done! And thank you for the tutorial and chance to win the minis! Your card is beautiful, thanks for sharing and for the chance to win. Love the way you’ve used the minis. Love the card. Love the colors. But when I saw the shimmer of the perfect pearls over the distress ink, all I could say was WOW! Thanks for the wonderful inspiration. Gorgeous 🙂 I love browns and blues together- very old world romantic. Mores stamps to add to the shopping/wish list—I feel like I’m forever playing catch up 🙂 Thank for a chance to win. I really, really, really want these. Your card is so pretty! Love that Damask Stamp and your greeting. So cute! Thank you for the Mini Distress Ink giveaway. Love those little babies and want them all. Beautiful card, Joy! Thanks for the chance to win some ink! I love you card it’s beautiful. I’m ready to win a set of Tim’s mini distress inks thank you for the giveaway. Beautiful card! I had forgotten about Perfect Pearls, thanks for the reminder! Your card is beautiful – love the color palette! I really like how you made your own background paper for your card. Love your colors also. Thanks for a chance to win these mini inks!!! What a lovely card! I love that saying … and the damask background is so beautiful! Thanks also for the clear instructions. Much appreciated! I’m crazy about these little babies! And the new tool too! It makes it so easy to add to stamps. Love the Perfect Pearls over it all. Love the simplicity of your card. Thanks for chance to win all 3 new mini distress sets! Love the gray and the chalkboard look great combo. I love your damask background. The minis look like a lot of fun! I love your card, so beautiful. Thanks for the chance to win. Love the technique that you shared, your card is stunning. Absolutely beautiful card, Joy. Thanks for the inspiration! love the shimmer, your card is beautiful 🙂 thanks for a chance to win the mini distress ink pads! Love your gorgeous card. Thanks so much for a chance to win!!! Love the color combos in these new sets! Love you’re card and loved how you used you’re minis. I would so love to have them. Thank you so much for a chance to win. Wow… love the perfect pearls on your card. Stunning. This might be a simple card but it has such a nice elegant look. Love it! Thanks for sharing and the opportunity to win these wonderful ink pads. BEAUTIFUL card Joy – the blended blue stamping is DELIGHTFUL and the Perfect Pearls on the sentiment is GORGEOUS – LOVE IT ALL!!! THANK YOU for the chance to win too – it would be SO EXCITING to add some more colors to my stash, to try the techniques you have shared today and then to neatly store these cute little minis in my ink pad drawer!!! 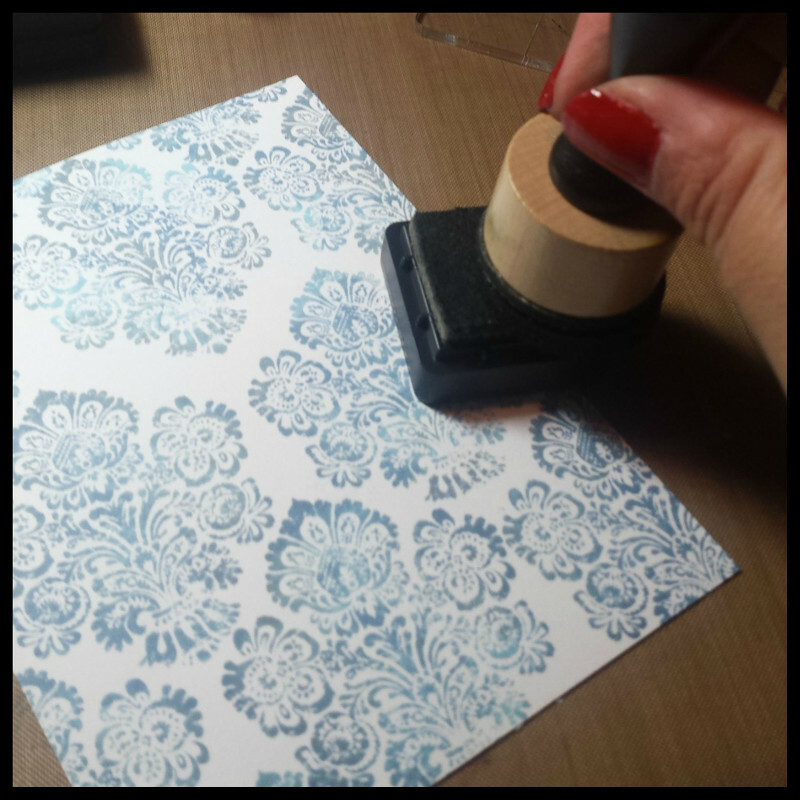 LOVE the damask stamping. Great card. Must pull out my perfect pearls again and give them a ride around the block. Thanks for the inspiration. chance to win such a fantastic giveaway. 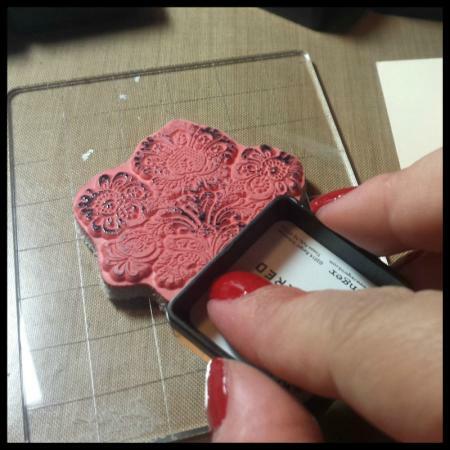 Loving those mini distress pads…tumbled glass…yum! Thanks for sharing your elegant and simple ideas! Thanks for your inspiration today and the generous giveaway! So beautiful card!!! thank you for sharing! I’m so happy Tim sent me to your blog!! lol Love your card. Thanks for sharing your awesome technique. Love the new sets of mini Distress Inks. Can’t wait to get some. This is such a pretty card! Very elegant! The mini Distress Inks look so fun! Popping up the center of the card for that 3-D effect really worked out beautifully. The 3 color idea you show on the stamp is the first I’ve seen using the mini’s. The mini distress inks are so versatile. What a beautiful card Joy… love the Victorian-styled background. I must try those Perfect Pearls – love the shimmer it adds! what a beautiful card! this is a great way to use the minis. Thanks for sharing! I love this card and the shimmer from the Perfect Pearls is simple gorgeous. And those minis…I love and want them! Thank for sharing. Beautiful card. One of the best things about the mini cubes, is the ability to add multiple colors to one image, YEAH! Thanks for a chance to win. What a great card! Do you remember who made the quote stamp? It’s a good one. Such a stunning cards. That background is just beautiful. Thanks for sharing and the chance for a set of minis. I like the added shimmer! I love how Distress can make a simple project so pretty 🙂 Lovely card! Hope I can add these mini’s to my collection soon! I’m waiting for the mini’s and the mini tool to arrive at my local store. Love the added sparkle to the card.